Hi guys! This afternoon I have swatches from one of my recent purchases from KB Shimmer. It's not often I get to blog about my own purchases so I'm very excited to have been able to catch a break so I could swatch these. I was literally jumping up and down when I got my order, and then they were sitting on my desk taunting me for two weeks! Now if only I could get all the cremes too... Addict life strikes again! 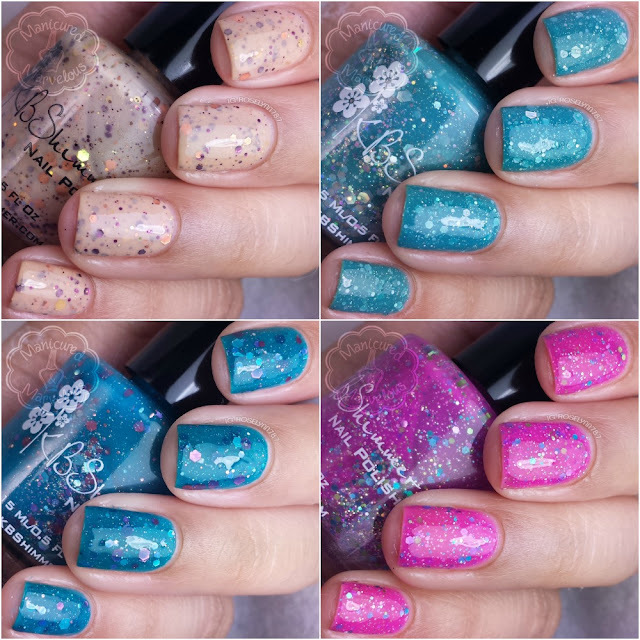 These four polishes are part of the Summer 2015 Collection by KB Shimmer. This was a massive collection released just a few weeks ago, 28 polishes in total I believe. Of course there was no way I could get them all, so I figured I would start off by purchasing my favorite finish first: the crellies! Pink-a Colada can be described as a violet leaning pink crelly polish with holographic glitters of lime green, light blue and pink. It feels like a very familiar shade, doesn't it? I don't have an exact dupe, but I do have 'An Offer You Can't Refuchsia' from Delush Polish which comes close. 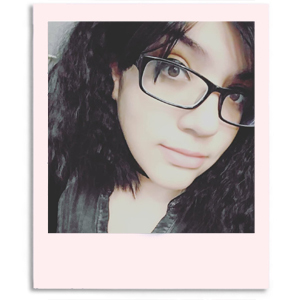 This one has a slightly more pink undertone though and either way I am in love with the crelly cutie. Shown here in two coats. Good formula and consistency, no glitter clumping either which is always nice. It is sheer in one coat, but evens out perfectly with the second. 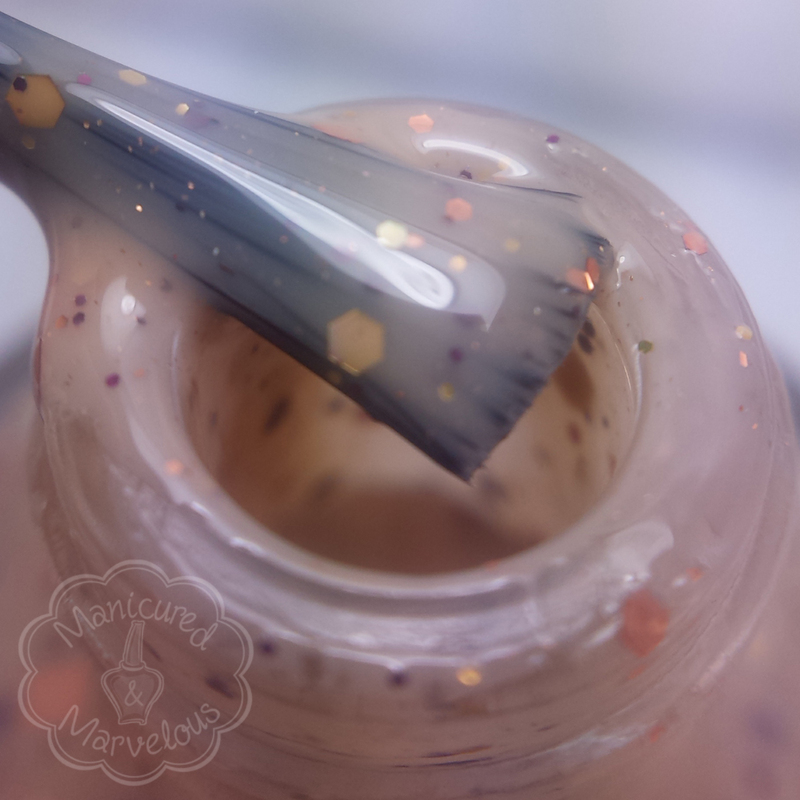 Shell Shock can be described as a peach crelly with holographic gold glitter, magenta glitter and copper glitters. Again, I found myself thinking 'Don't I have this?' once I swatched it. I do own the spring release 'To Peach His Own', which has an identical base color. I do think I prefer the glitter color combination in this one a bit more though, so I guess that's a plus for me. Three coats. Good formula, didn't give me any issues when applying. Home Surf can be described as a muted teal crelly with silver holographic glitters in several sizes. Isn't this just drop dead gorgeous? For some reason though I keep thinking of the movie Frozen when I see it. This of course then makes me think of winter and not summer. Regardless of my silly brain, I love this one so much. 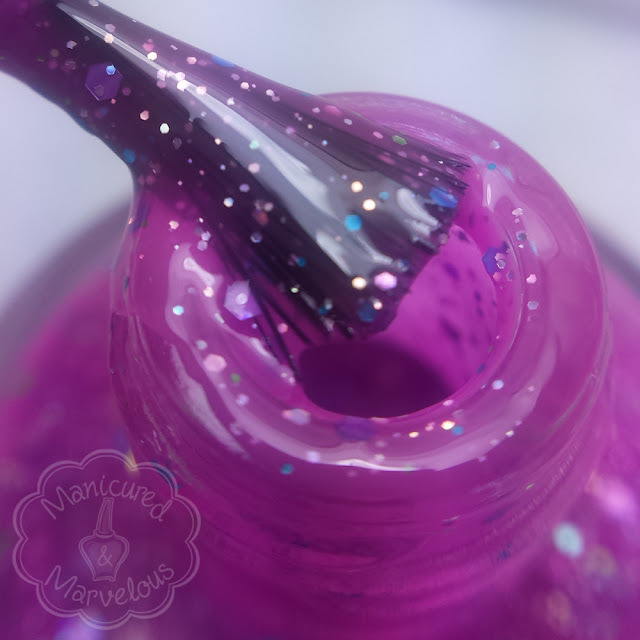 It's a fantastic color to glitter combination! Three coats. Great formula, identical application as Shell Shock. 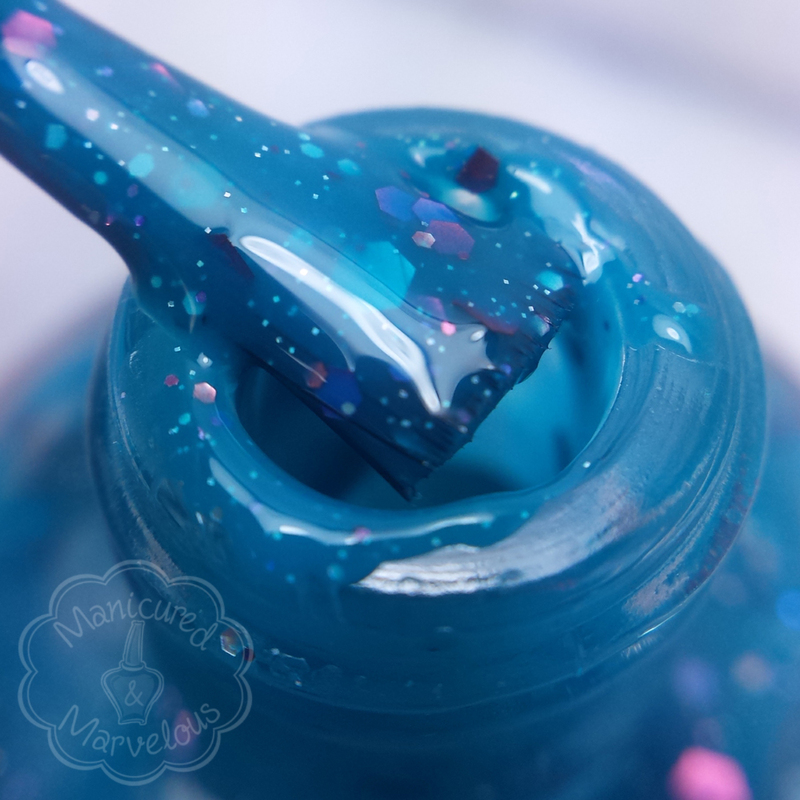 Vitamin Sea can be described as an aqua jelly polish with pink, silver, and micro holographic glitter. One of the only jelly polishes to be released this season, this one is absolutely the definition of lush. And let's not forget that squishy finish. Definitely my pick for must-have for the summer! Two coats. Good formula and consistency, not too thin or too thick. I did experience very minor staining to my cuticles, but none to my nail bed. Overall while I am happy with my purchases, I do find myself wishing I would have gone with the cremes instead of these crelly polishes. I think the only one of the crelly polishes swatched here I can say is a must-have is Vitamin Sea. KB Shimmer is still one of my favorite indies that I love giving my business to (their customer service is hands down the best I have ever experienced). So if you don't have dupes for any of these then you will be immensely satisfied, especially with the formulas. So tell me guys, did any of you end up getting the summer release? I totally understand #addictlife! If I had to pick just one (and we both know I wouldn't in real life) I'd go with Vitamin Sea. Haha. Exactly! Why pick one when you can have them all, am I right?! Lol. Kbshimmer always amazes me with their crellies! The crellies are always impressive but I get more taken in with their cremes lol. This collection is fantastic. I got several of the polishes from the collection - definitely couldn't get all of them! I think the crellies might be my favorite. Right?! From the moment I started swatch photos I knew this collection would wreck my wallet. That's how I feel about KB Shimmer in general, I need them all! Lol. I don't buy many glitter polishes these days because removal is such a downer, but I couldn't resist Pink-a Colada because yummy! 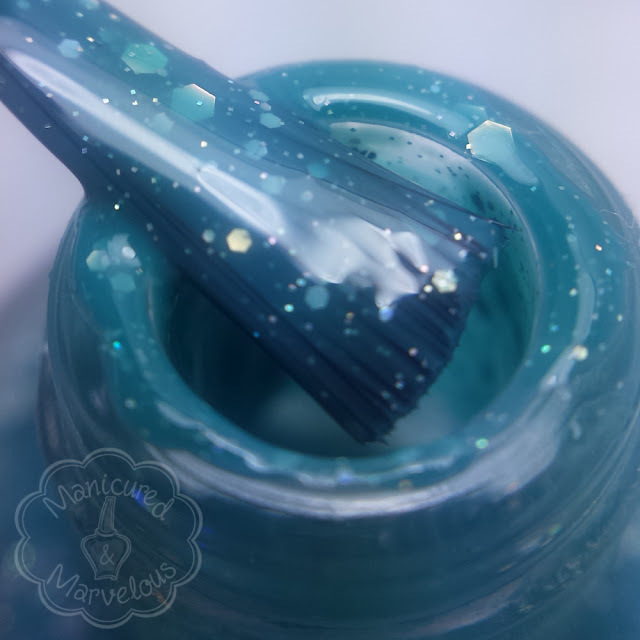 Besides that I got five of the tropics-inspired faded neons and am really enjoying them -- I hope you will too! Beautiful swatches and photos! Thanks so much! Glitter removal is never too much of pain to make me stay away from them lol. But yeah those neon cremes look so lush and lovely, I cannot wait to get them. Nobody does crellies (or puns!) better than KBShimmer. Haha yes the puns are definitely one of the best parts. I am amazed at the cleverness! I love LOVE KBShimmer so much!! Her glitter crellies and jellies are amazing! These are all hits in my book! KB Shimmer crellies are some of the best, love them to pieces! I just adore KBShimmer. It's hard for me to browse her polishes without wanting to buy every single one of them. These are all beautiful and your swatches are lovely! I've passed on all the crellies but will definitely be getting some others from the summer collection. KBShimmer did a great job with the summer collection and the creams are definitely worth it. I think you've convinced me that I need vitamin Sea! Shell Shock makes me happy every time I see swatches of it. Gorgeous nails, but I'm trying to follow you on Instagram and I keep clicking follow and when I try to refresh it still says follow, I need to follow you in order to get credit for it in a giveaway and I've already claimed that entry, please help! Hmmmm, I'm not a fan of these. I like glitter crellies/jellies but I feel like I've seen these before. I love KB Shimmer crellies! (She is also one of the few indies I will purchase cremes from.) I have and love To Peach his Own, and just picked up Shell Shocked. I love your macro, can't wait to try it! Absolutely stunning and Shell Shock is such a refreshing change of paste from the summer neons! I love KBShimmer but I still haven't decided which ones I want from the summer collection! Shell Shock is so pretty! KB Shimmer makes great crellies! I don't know how she comes up with so many ideas! Your swatches are lovely!! I adore all of these on you but Vitamin Sea is especially gorgeous!! I'm on a mission to slowly complete this collection LOL. Every one is a must-have so it's tough! !